INGREDIENTS: Raw Fermented Cod Liver Oil, Concentrated Raw Butter Oil, Unbleached Beeswax (thickener), Plant Cellulose (capsules). CONTAINS: Cod (Gadus macrocephalus Pacific Cod), Milk. 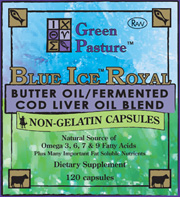 BLUE ICE™ Butter Oil / Fermented Cod Liver Oil Blend Capsules combines X-Factor™ Gold High Vitamin Butter Oil with Blue Ice™ Fermented Cod Liver Oil to provide a pure, clean and nutrient rich sacred food.